We haven’t decorated for Christmas before. We just don’t do Christmas. 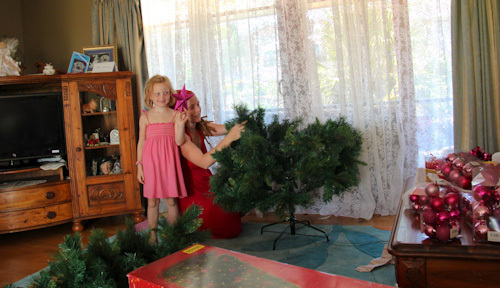 But visiting Aunty Gwenda was the excuse we needed to get into the Christmas spirit — by setting up her tree for her! 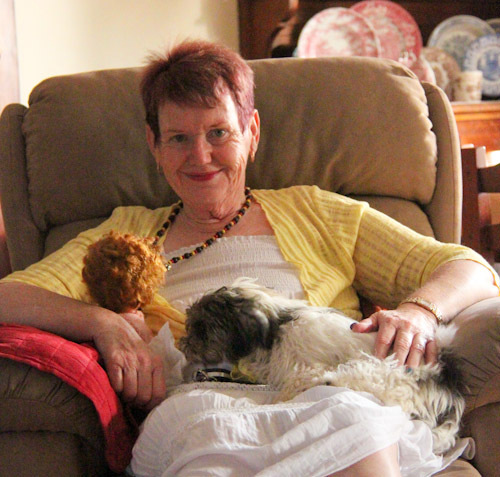 Gwenda is a lovely hostess to our family, and the girls consider her a favourite! Our girls have great memories of my dad’s sister Gwenda who helped smooth our transition from a two-parent to a single-parent family earlier this year. She is legendary in the girls’ minds, and we’ve been looking forward to seeing her again! 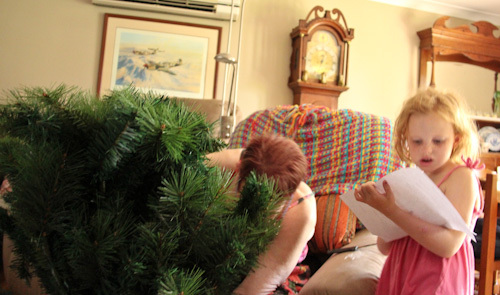 Reading the instructions is a cliché — one we don't indulge in until we realise that we're not putting the tree together properly. I painstakingly unpack each set of branches for a more "natural" look while Brioni focuses on the decorations. 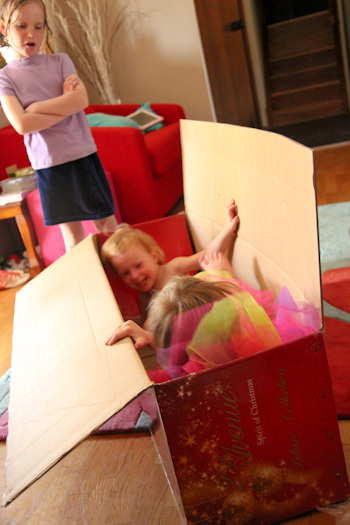 Calista and Dell love playing in the tree's large box. When the tree is set up, we start loading it with decorations. 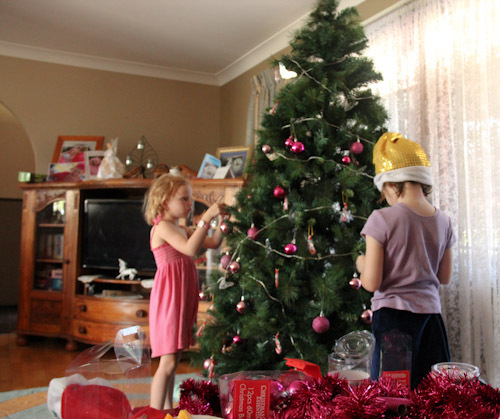 Aisha and Brioni work methodically to give the tree an even spread of bling. Aunty Gwenda keeps plying us with treats all day — living up to her reputation as "The Yummy Lady"! 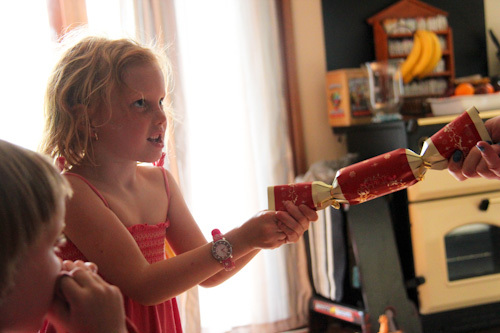 While bringing out the tree decorations, Gwenda finds some Christmas crackers and introduces them to Brioni. 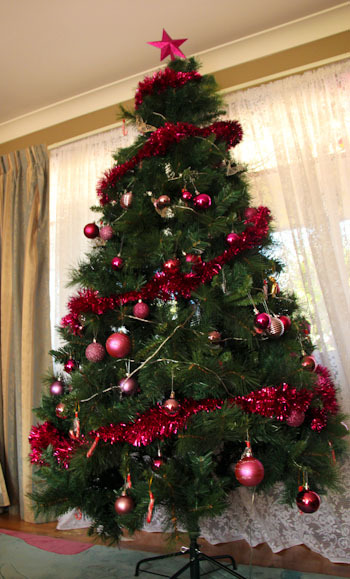 It's a beautiful, pink tree — perfect for Aunty Gwenda, and something that will remind her of our family after we drive away! In our race south, we don’t have much time to spend with friends and family, so all our visits are short, but it’s wonderful to see familiar faces and be reunited with people we love. 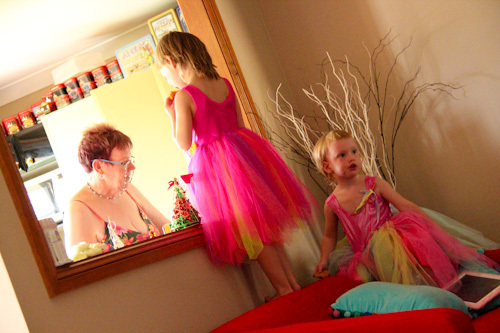 Thanks for sharing your Christmas spirit with us, Aunty Gwenda! You’ve given us a memorable visit to always remember, and we look forward to seeing you again next year. That is one thing that I do miss – our Christmas Tree. Its in our shipping container! Merry Christmas to you and yours and I loved those photos! Looks like they had a lovely time. What lovely memories to have, it’s always a special event for us home-dwellers every year, we look forwards to trotting out our favourite ornaments given and collected over the years, including painted tin can ornaments made by street women in Mexico, given as a gift at our wedding! Strangely enough, I did wonder what you did for xmas on the road! It’s all about love and family so I guess christmas is lived out every day on the bus! Since you are the only person I know south of the equator, what Christmas songs do you guys sing in Australia? Prolly not ones out cold weather. I never thought I’d see you decorate a Christmas tree! What a sweet thing to do for your Aunt. Looks great by the way!